In this UnitedTrading review we prove that this platform is a huge scam. It is presented by Professor Anthony Grecko. Grecko says that his group of students created United Trading Network, which a social trading network for binary options. This platform allegedly has an 80+% winning ratio, so it can make you a lot of money. 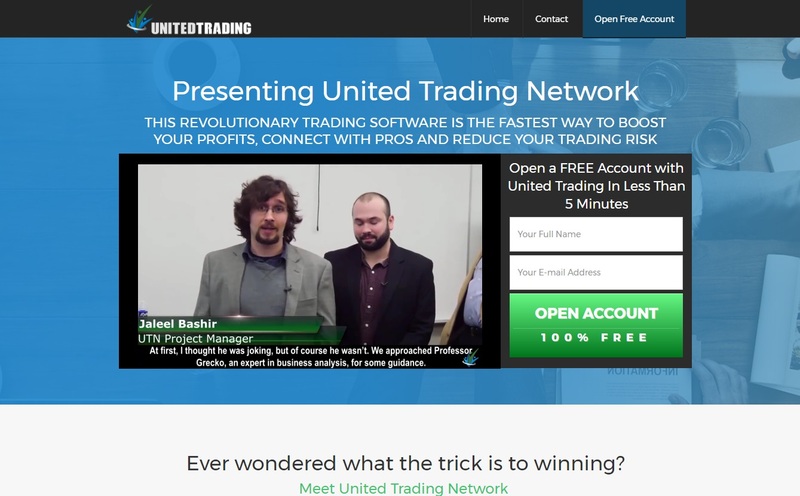 Let’s put it straight, the United Trading Network is a total scam made to lose your money. Professor Anthony Grecko, Adam Fletcher, Jaleel Bashir, Matt Kirby and Lydia Williamson are just paid actors. They are playing their roles and in reality they are not traders at all. We know some of these faces from other scams. Like Anthony Grecko, this guy is known from the Millionaire Blueprint scam where he played the role of Walter Green, check our picture to see a proof. So now you know that the whole story about a Professor and a group of student creating a trading platform is a big fat lie. In the video they say that the group of students created a social trading platform for binary options in 2016. Yet on the webpage you can see some alleged awards from 2014 and 2015. This proves that they are lying, these awards are totally fake. See the picture. You can also do a search about other alleged awards they won with UnitedTrading Network and you will find nothing. This thing is total fiction. We tested the United Trading Network to see what is the software about. And surprise, we found exactly the same software as with the Trader’s Buddy scam, look at the picture. This shows that we are facing a white label software that is being bought and used by scammers. We’ve seen this many times, somebody creates an app that can trade binary options, but not profitably. It is then sold to scammers who rebrand it and try to make you believe that it is profitable. Why? See the explanation below. After registering for UnitedTrading you will be pushed to deposit money with a certain broker. The reason is that scammers behind this program a are affiliated with this broker, they get paid for referring new depositors. This is the only purpose of United Trading, to earn affiliate commissions to scammers. This is also why scammers don’t offer demos of their platforms, or they do offer a demo that fakes results. They need you to believe that they can make you money and they can’t let you uncover their scam before they earn their commission for making you deposit. United Trading Network is a dirty scam that will make you deposit and lose money. We know it has a lot of positive reviews on other websites, but these websites are run by scammers that promote scams for money. So beware! Nobody will make you money for free. To make money with binary options you need to learn to trade. It takes time, but you can try and do it on a free demo account with a regulated broker. Only when you can trade with consistent profits on the demo, you can switch to a real account with real money. Seems that we got a new trading platform spreading among scammers. I’ve seen some good reviews on Youtube, but it all seemed strange to me, the professor doesn’t say the school, neither the students do. I was trying to find where are thy from and then I found this review that explains it all. Great review, as always, John. Great job john. I just saved my last penny. Thank God i found your article. God bless your good deed. Great site I’m sure so many have been saved by reading your content. You know binary trading is growing so fast sadly with that comes the scams around it. I really appreciate your site for it helps people not to make the wrong choice. It’s what is needed. Thank you. Keep up the great work.